The NexGen-2000 is the only one-step system with a micro-knife seal temperature adjustment. This shrink wrap system has a timed double magnetic cover latch and has the ability to wrap packages up to 16.5″ x 21.5″ x 10″ high, at a rate of 4 to 8 per minute. This compact shrink wrap machine includes a stand with heavy duty lockable casters which makes it easy to move this machine from place to place. The NexGen-2000 features a clear chamber cover which allows the operator to view the product while shrinking for quality control. The anti-adhesive Teflon Coated Sealing Blade and fire-stand glass fiber sealing blade holder assures a clean and strong seal. The micro-knife compensator limits the sealing temperature for great quality every time. An advanced pin perforation device is included with the machine allowing for air to escape shrinking packages even using super-fast high shrink films. If you have any questions or are interested in purchasing the NexGen-2000 One Step Shrink Wrap Machine, visit us at SpiralBinding.com. 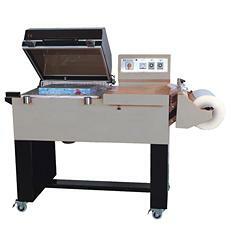 We have great pricing on a full line of Shrink Wrap Equipment. Call us at 1-800-631-3572 for more information!